Nice blog post over at Heavy Metal Overload. 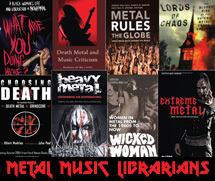 If you’re a librarian looking to add to your metal music titles – add this new serial to your “must buy” list. It’s a visually appealing magazine that highlights visual artists working under the umbrella of heavy metal music. It’s also way overdue.